In the centre of the lively Jordaan is Cinema Paradiso an excellent choice for any party. Walking past the enormous aquarium filled with lobsters you'll enter the classic Italian space where a chandelier swings over your head. Pizza and pasta without limits and perfectly prepared by the chef. Also notice the projection screen with the occasional maffia film showing! Nice food, good wine, nice location and friendly staff. Apparently this place is mostly visited by locals, so a good way to feel the real Amsterdam vibe. Nice Staff and the food was amazing! I will come back. Everything was amazing! The food, the service, the atmosphere and the ambiance was wonderful. I’m definitely coming back to the restaurant and bringing a friend when I visit Amsterdam again. I went to Cinema Paradiso to celebrate a birthday dinner with my parter, it turned to be an amazing option. The food was delicious, the staff was super kind and we got compliment drinks at the end together with dessert. Definitively a must place, 5 stars!!! Great Restaurant, the ambient could bem a bit renewed. Been here with a group of colleagues. Wow.. what a place from the entrance to the dining room. The spectacular wall painting is a true eye catcher. We chose for a menu and we've been spoiled with delight. Nice wine's good food and nice ambiance. Time flew by! Would come back for sure! Amazing service and food to match. Would definitely recommend. Really enjoyed the food. Pure and very tasty. The service was great too! Really enjoyed this place together with my partner. Food was really good and the host (one of the co owners) made it an unforgettable night! This place really suits more occasions. For us it was a romantic get away. But there is a space as well if you want to go out with friends. The restaurant, people and food where great. The place is really noisy, try to change this. 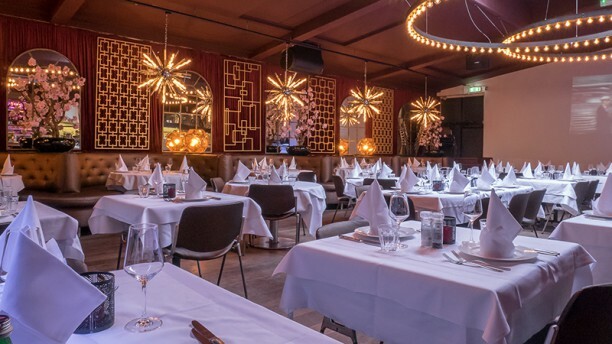 I often Come to Amsterdam and i have always eaten in the City, since i have eaten once in the jordaan in Cinema Paradiso! Everything is Perfect, the Service, the Beauty of the Restaurant and the delicious Italien Food! Now Everytime i Come to amsterdam i have to eat at least once at Cinema Paradiso!